The ever-famous concept of a protein source that is transported by a tortilla has stood ground as the dominant cultural food staple of the Mexican nation since time began. As you can probably imagine, as locals, we know where to go when it comes to getting the best tacos (for the best price) in town. Starting at 6pm, El Ahorcado is pumping out live music, hot tacos and cold pineapple mix drinks, causing them to quickly become a local’s favorite, since 2013. Trekking from Cabo San Lucas deep into San Jose Del Cabo via highway is more than worth it for this culinary experience. Off of the main highway, near Walmart, a metal framed structure with a hanging man illuminated by a decorative stoplight lets you know you’re in the right place. Upon arrival, you’re greeted by the warm smell of the kitchen and live acoustic music accompanies the friendly atmosphere. Seats are taken on wooden backed benches at family-sized tables, where fresh salsas and spiced vegetable toppings line the lumber from end to end as they wait for their entrée dates to arrive. Homemade bean soup is a great precursor as you tour the standard issue menu. It’s pretty simple; every taco can be a quesadilla, but not all quesadillas can be tacos. Any questions that arise can be directed to Julio, our go-to waiter who can explain all aspects of the menu on cue. From grilled steak to poblano peppers & corn (rajas), everything that’s coming from the kitchen in a corn or flour tortilla is nothing but a blend of freshness, seasoning and atmosphere. 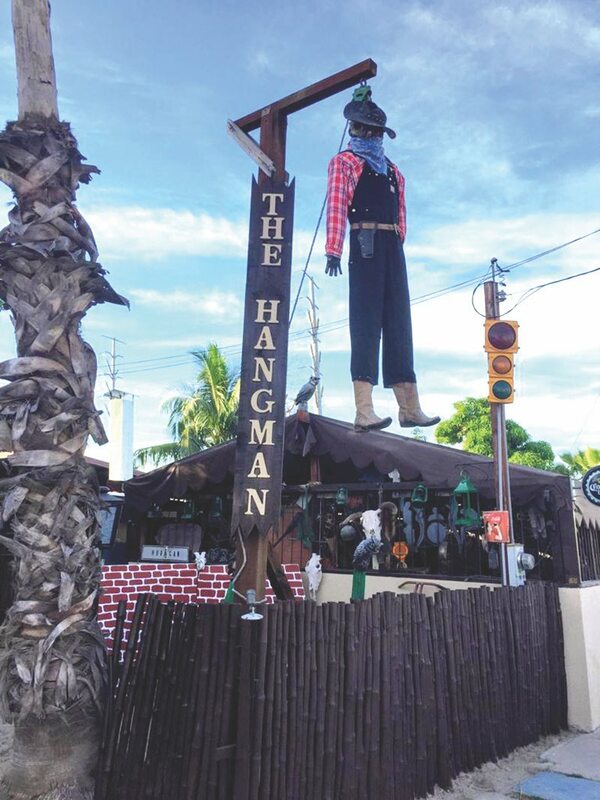 With old barn equipment, metal signs and miscellaneous knickknacks littering the walls and ceiling as decor, dull scenery is the last thing you need to worry when dining at The Hangman. Guitar chords and bongo drums lightly cover the murmur of the crowd as waiters rush from the kitchen every minute to flip tables as fast as they can. Our groups never fail to start a competition of whom can withstand the most habanero salsa as we wait to place our order. With signature drinks to suppress the heat, handcrafted pineapple and strawberry sparkling sodas are a refreshing addition when salt and spice are the stars of the show. Our favorite cocktail, The Ahorcado (convenient enough?) is either a mezcal or tequila over ice, mixed with simple syrup, soda water, and freshly grilled pineapple. Served with a long spoon to provide aid in reaching the crushed Pina on the floor of the cup will have you ordering round 2 as you fish through the ice for the last one. As per our most recent trip to The Hangman Surf and Tacos, a new menu favorite took gold. One queso fundido cheese plate, topped with any choice of 3 different taco stuffers, provided enough “quesadillas” for two people to be completely content if they were to share it as a meal. Corn tortillas, the Hispanic specialty, were the preference of the crowd as we enjoy melted cheese with flank steak, chorizo, peppers, mushrooms, pork and artichoke melted in. Clean, fun, authentic and completely affordable. Everything a local wants when it comes to a spot we hope never gets too big. Find out more on Facebook or look up reviews on TripAdvisor. We here at Destino want to remind you that good food is best shared with great company; go see what you think of the newest spot.